SunPatiens has made it through the rigorous testing to now be named a Louisiana Super Plant. Please help me in giving the SunPatiens a warm, or better yet, an extremely hot and humid welcome to this prestigious group of plants. Our shade-loving impatiens have been a staple of color for planting in our Louisiana landscapes. But for anyone who has planted our shade-loving impatiens in the past, they soon realized impatiens must be planted in the shade and cannot tolerate our humidity for very long. Leave it to this rebel to go against the norm. The SunPatiens is moving into uncharted territories, places where no impatiens has gone before – full sun. This low-maintenance annual is available in three distinct series, which include the spreading varieties, compact varieties and vigorous varieties. Every year new colors and varieties are typically added to these groups. The 15 varieties considered to be compact growers are the ones that attained the Louisiana Super Plants status. Of the compact groups, the smallest-growing will reach 18 to 24 inches tall and the same width. These compact varieties are able to hold up to the heat and humidity of the summer and the fall months. It is best to plant SunPatiens prior to May. This ensures the plants will be established in the landscape before the extreme heat of the summer. The large and showy flowers of the SunPatiens are easily recognizable and can be seen against its dark green glossy foliage from a distance. This quality makes it an excellent choice for color in the front landscape to enhance your curb appeal. 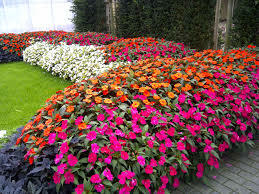 The many colors of the compact SunPatiens include blush pink, coral, deep rose, electric orange, fire red, hot coral, lilac, neon pink, red, pink, orange, orchid, white, royal magenta and tropical rose. While SunPatiens can be grown in full sun, if you happen to plant it partial sun, you may need to prune the plant back in midsummer to maintain its bushy growth and great flowering. Otherwise, they will become lanky and produce fewer flowers. The SunPatien has proven itself at the trial gardens at the LSU Ag Center Hammond Research Station since they debuted. They have also moved onto the list of highly desired and widely recommended flowers for summer color here in the South. Planting SunPatiens in the landscape now will allow you to drink lemonade in the shade while this plant takes the brunt of the summer heat – and enjoys it.